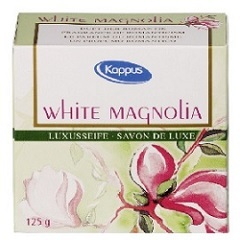 Kappus White Magnolia Luxury Soap was the first romantic fragrance introduced as part of their "romantic series" of luxury floral soaps, and the fragrance remains unchanged to this day. These beautiful round soaps with their precious embossed surfaces and pearlescent appearance have an intoxicating floral fragrance reminiscent of a warm summery day in the garden, and fill your bathroom with a sophisticated perfumed scent like a bouquet of romantic flowers. Founded in Offenbach, Germany in 1848, Kappus is the original manufacturer of hard-milled glycerine soaps. Their soaps are colorful, imaginative, and beautifully packaged with fragrances that delight your senses. Kappus soaps comes in many different shapes, sizes and colors, and are milled six (6) times to create a long-lasting bar.